It’s beautiful today with temps around 70 and the back door open, fresh air filling the house. Sure it’s humid, so what? I’ve just swept the back porch, tossed a dustpan full of ladybugs out the door, and dusted. It was a grilling afternoon – I made grilled pizzas, and I want to make note of what I did because I don’t know how much pizzas “speak” of spring, but the taste, the attitude, was perfection. 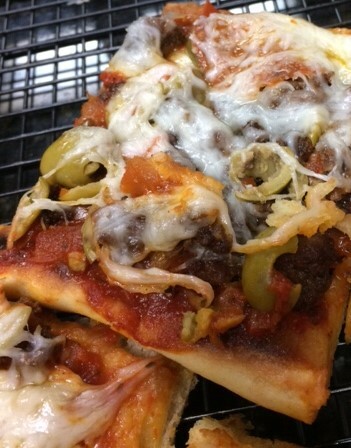 I blog to leave a more or less permanent reminder of what I’ve done, so I want to note here that the pizzas were from this dough from the King Arthur Flour website. I would love to claim every King Arthur recipe as my own, but that just wouldn’t be right. This winter, because I couldn’t get out on the back porch, that site and the Tartine Bread book totally stole my heart as I made sourdough starter from scratch and beautiful rustic loves that were eaten just a little too quickly. The scale fussed at me, and I calmed the bread fervor. But it was great fun, like a mad scientist at work with a postal scale counting grams of flour and an eye on the clock for every step. In the Tips and Reminders category for when I look back at this next month (next week??) –remember to olive oil each side of the crusts. And poke them with a fork. And let them rise on silpats so they can be easily flipped to a baking stone. Make 2 crusts from the recipe, they are the perfect size for switching up ingredients. Pasta sauce/hamburger seasoned with basil and other good things/pepperoni/green olives/mozzarella on one, bbq sauce, hamburger, pepperoni/mozzarella with bacon on top for the other. Wow. Sometimes I think we may never go out again. Of course, instead of cleaning the bathrooms which was what I intended to do today, when I started making the dough I realized I had that sourdough starter resting in the fridge…so I found THIS yummylicious recipe which is rising right now and will rise overnight, to have tomorrow with some soup. I just can’t stop the breadmaking. Now, to focus on “control” so the scale doesn’t hiccup again. So that’s the view from the back porch today. Swept, dusted, breezy, warm, lovely. A little cloudy, but that’s okay. I couldn’t wait to tell you. Won’t be long before the leaves spring and the sun springs and life springs from everywhere. I was knitting out here this morning. Latest project almost done and I’ll be posting that soon! Time to get back to Millie. And knitting a top. And crocheting blocks. And more grilling. And wine and great conversation. Loving every minute of it.